She’s also not prepared for what she sees inside the house. ALL of their things are gone. The house is empty…well except for the stranger’s things being moved in. Prior to this, Fiona and her soon to be ex-husband, Bram have been sharing custody of their boys, as well as their house at 91 Trinity Avenue. Whoever’s turn it is to be with the children stays in the house with them while the other parent stays somewhere else. It’s a fairly new and unique way of doing things. It’s called “Bird’s nest custody”. Though I did figure out a couple of things ahead of time, I was still completely in the grip of this intriguing story. An interesting plot, some great characters, along with a few great twists made this a very enjoyable read. I also really liked how everything came together in the end. 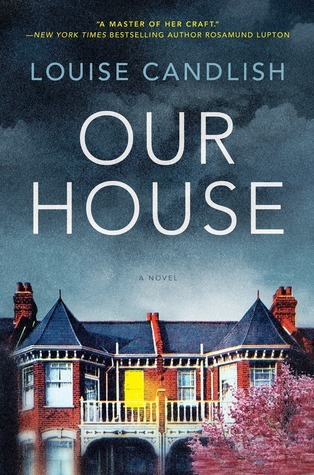 In my opinion, “Our House” was a well-written, intriguing domestic suspense novel that has me excited to see what Louise Candlish writes next! Wasn’t it fantastic? Loved your review! The ending of this one just floored me! I’m going to have to read more of her books! It was really good! I’m glad you liked it too ❤ I'm excited to read more of her books too! I almost didn’t read it, so I’m happy I did! I hope we both enjoy her backlist! I’ve been on the fence about this one but I do like the sound of a surprising ending so I think I’ll squeeze it into my fall TBR. Great review Deanna! This one has had mixed reviews, so I was looking forward to seeing what some of the blogs I read had to say. Nice review Dee, it has made me a little less leary about this one. I will post my review once I get it read. I liked this one too. Absolutely loved the ending!! Great review! I haven’t read a domestic suspense in ages! This one is on my MUST READ post for August Glad to hear it is good! Great review! Thank you! I hope you enjoy it too.